My grandfather was born in a small mountain village in Sicily, under the shadow of Norman Ruins, where he finished school early and worked as a plasterer and farmer. He was conscripted at age 17 and fought in the 4th regiment of the Piemonte Brigade in "Alto Adige" [Trentino]. He survived the influenza epidemic, the post war financial collapse and famine and emigrated in 1922 becoming an American citizen. He probably had postencephalitic Parkinson's Diease (Von Economo's Syndrome) from the 1918 influenza epidemic, but managed to do well with it until his latter years. My friend Leo Benedetti has helped research the war record of the Piedmonte Brigade. In the time of Caporetto " the Piemonte brigade withdrew in perfect order... and counter-attacked the advancing enemy's flank in their advance from Udine-Codroipo"
Transferred to the Piave; later involved in the final crossing in the area of Nervesa with the 57th divison leading up to Vittorio Venetto and the end of the war on that front. 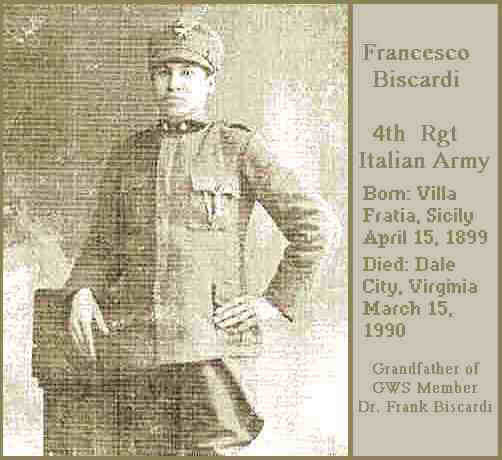 The entire Brigade was awarded the Medaglia Di Bronzo "for bloody,obstinate attacks with consequent important results notwithstanding the difficulties if the terrain and the artful and tenacious resistance of the enemy in the batttle of S.Marco (August 1917). Equally for the alacritous demonstration in the battle for the conquest of Nervese (19-23 June 1918) and at Vittorio Veneto (Oct 27-Nov 1, 1918)"
Rarely would he speak of the war. He would shake his head and talk of the "great destruction". When he was in the mood he would talk of the cold and snow. Once he went over the top and ran up against an Austrian lying prone with his gun pointed at his chest. Grandad's cartidge did not go off ( not an unusual occurence)and he thought he was dead. Actually the Austrian was dead and frozen solid still in the firing position. He would jokingly gripe about the food. Mostly they fed him rice for two years. I never saw him eat it in the thirty years I knew him. He was a bit more bitter about the terrible quality and scarcity of ammunition. He was asked to go over the top once with only three cartridges. About the bombardments he would not speak.